Following up on my post defining and disambiguating (hopefully) cloud services and cloud computing, I hope to quantify the cloud services market and lay out the landscape to better understand the various players in this industry. IDC and Gartner probably have the best possible data points for any given industry. In this case, let’s assume they are reasonably accurate. 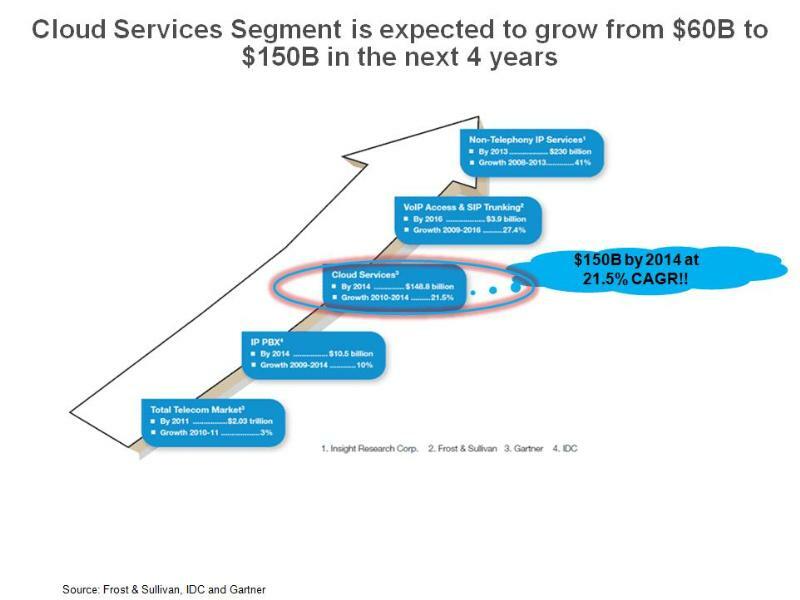 We see that the Cloud Services market is forecast to be approximately $150B by 2014 from $68B as of this year. 1. We will see more applications being deployed in the cloud. Ergo, more data and content will move from being hosted locally to ubiquity. 2. Most of these services will occur in the enterprise landscape as almost all companies are cutting back on datacenter expenditures and are looking for cheaper and efficient application hosts. Case in point – Salesforce, which is enjoying greater success in recent times. Please take a bow Marc Benioff for envisioning and to some extent, helping create this landscape 10 years back! If you can dash to my earlier post about cloud computing/services, you will find that the the 2 boxes at the bottom of the landscape image indicate how virtualization and hardware are the true cloud computing pieces. The rest can and should be called cloud services. In combination with “Infrastructure as a Service” (Iaas), they form the basic building blocks for cloud services. Notable names in these areas are Sun (now Oracle), HP, Dell, IBM, EMC, VMware (vSphere), Rackable, Eucalyptus, Joyent and Amazon’s EC2 web services. Platform as a Service (PaaS) has a few major players: Microsoft (with Windows Azure – thanks to Ray Ozzie), Joyent and Appistry. 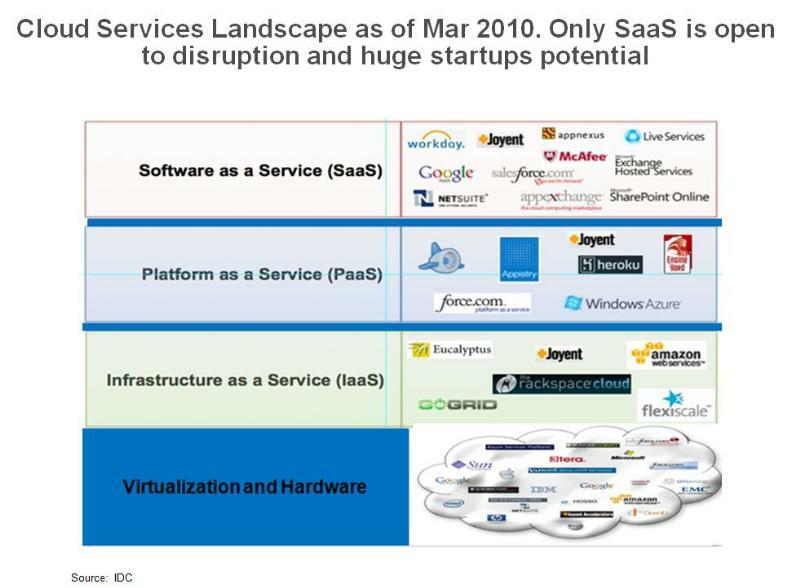 Software as a Service (SaaS) has many players and is much more fragmented. It is really the Cloud Services sector that most of us refer to when we mention cloud services or computing. Notable players include: Google (docs, apps), Microsoft Live Services, Microsoft Sharepoint, Salesforce.com, workday, netsuite and appexchange. As it must be obvious, only SaaS is open to disruption for smaller players or startups. The rest might need scale, higher capital outlays, more consumers who can be locked in and startups are usually short of all of these. Hence, an easy entry point for startups or potential disruptions could be offering a great solution in SaaS and slowly, branching out into a platform and then infrastructure and all the way to virtualiaztion/hardware.